Here are some resources to give you some guidance in sending your care package, as well as a listing of some of the many organizations that support our deployed military personnel with packages. These organizations depend on supporters like you to do what they do! store bought cookies are typically preferred as homemade cookies usually arrive stale and crushed. Regardless, any kind of separation from friends and family is tough and receiving some love from home by way of a care package is always appreciated! Army Wife Network has a great list of suggestions of what you can send. Taste of Home also offers suggestions in creating your care package. Cakes and cookies submitted by Joanne K.
Place one container upside down and one container right side up in the Flat Rate box. They will fit snugly and not rattle. The bread will dry out during shipping, but the bake goods will remain moist and intact. A nice way to send your Soldier a birthday cake in a jar. It is hard to have a Soldier away on their birthday so we have a way for you to get them that cake while they are overseas. It is notoriously hard to ship cupcakes. When trying to ship cupcakes, there is that pesky problem of keeping the cupcakes from turning upside-down and the gift arriving as a frosted box rather than frosted cupcakes. So how do you ship cupcakes? Read the article for more information. Christmas ideas submitted by Joanne K.
For Christmas I try to put in little touches of home. Christmas foods like candy canes, carmel corn, cookies, etc. When my niece was deployed, I sent her Christmas socks along with the goodies. She loved that! Last year I sent another Soldier some funny little non-breakable ornaments. He really liked that. Personalized calendar with family photos and special days marked. Cards for different occasions so that the soldier can send them home to loved ones for various occasions. Sports items such as baseball caps/balls, footballs, volleyballs, soccer balls etc. stuff to hang up, etc. Our mission is to achieve postal service excellence throughout the Department of Defense by promoting the efficient, economical transportation of mail; by ensuring the effective operation of military post offices; and by providing sound management of the official mail program. Site includes Iraq, Afghanistan and Kuwait mailing information as well as lost military parcel procedures. Since Priority Mail service supplies are the packaging of choice for families preparing care packages for service members overseas, the USPS has created a "Mili-kit" based on the items most frequently requested by the military. 1. Choose your language (“1” is English, “2” is Spanish). 2. Choose option 1 (it states it is for Express Mail service, Priority Mail or Global Express Guaranteed). 4. Please allow 7-10 days for delivery. Note: These are free supplies, postage must be affixed. Adopt-a-Chaplain sends care packages to military chaplains serving in the Middle East to be distributed to the troops to build morale. AdoptaPlatoon strives to provide a better deployment quality of life by sending cards, letters and care packages to lift the morale of Troops as they serve far from home and assist military families. AdoptaPlatoon provides an on-going mail support system, creates projects that meet the need of military requests, and establishes special projects that benefit deployed Troops representing all branches of the U.S. military. AdoptaPlatoon also serves injured Troops through AAP Walking Wounded Project and assists military veterans who remain our Nation’s Heroes. Project created by the AdoptaPlatoon™. Adopt A US Soldier is a non-profit organization that seeks volunteers to help show the brave men and women fighting for our freedom that their sacrifices will not go unnoticed. It connects supportive civilians with deployed troops and offers a channel by which to communicate encouragement and express gratitude to those brave men and women serving in the United States Armed Forces. Staffed fully by volunteers, AAUSS has helped thousands of soldiers find friendship, support, and a much loved and needed touch of home. Adopt A US Soldier is active in over 170 countries/ territories/ independent states with thousands of active volunteers supporting our troops by adopting a soldier. It is very easy to do and more rewarding than you can imagine, and you will show a soldier that you support them and cherish your freedom. A Texas charity sending care packages of food, gifts, clothing, toiletries, movies, toys for local kids, medical supplies and other donations to American soldiers and troops serving in the United States Armed Forces in Iraq, Afghanistan and the Mideast! Annual year-round support and Challenge America (July, November-National Packing events). Our goals are to ensure every deployed Service Member receive a care package, through regional and local partnerships. Have no idea what to send, who to send it to, or where to send it? Our vision is to become the foremost non-profit, charitable services provider of military support in New Jersey, and ensure that our men and women in uniform are properly recognized and remembered for the sacrifices and hardships they and their families endure, before, during and after their deployments. Our goal is to continue to provide meaningful services and care packages for every service member we support. Our goal is to fulfill the wishes of our troops to the best of our abilities. This is our small way of letting our brave troopers know that we care about them and appreciate their sacrifices. We conduct fundraisers, sell merchandise, and collect donations to finance sending care packages to our troops. We also match troopers to volunteers who would like to send care packages to their own "adopted" trooper. Following in the footsteps of our grandmothers and mothers, we have mailed "a little bit of home" to our sons and daughters serving around the world. Often commanding officers in the field will contact us to let us know that they have a young man or woman who is not receiving any boxes or letters from home. These kids quickly come into our hearts and soon receive a care package with a big blue star on the box, letting them know that good people from Alameda and Contra Costa Counties in California think about and support them. Our boxes have come to have meaning to the troops overseas. We know this from the letters we receive. We depend on your generous donations and volunteer help to continue sending these care packages and notes from home. We provide care packages and letters creating a connection with our active duty troops. Due to the growing needs of our veterans, we expanded this program to provide items to organizations that serve homeless veterans and also residents of our local veteran’s memorial home. Weekly Boots on the Ground NY pack care packages to ship to Afghanistan and other remote locations. Do you have a loved one or friend who is thousands of miles away from home defending our country in uniform? If so, Freedom Alliance would like to send them a "Gifts from Home" care package, which will be a great reminder that you and a grateful nation have not forgotten them. The Freedom Alliance “Gifts from Home” project provides those in harm’s way with some luxuries of home and expresses our appreciation for their sacrifice. It is our hope that the items sent will make life spent thousands of miles from friends and loved ones a little easier to bear. These "Gifts from Home" boxes are full of most-requested and much-needed items, such as prepaid international calling cards, candy, toiletries, games, non-perishable food items, Germ-X hand sanitizer, books, magazines, DVDs, CDs, greeting cards and notes of appreciation and thanks from caring Americans all across the country, and much more. Last year, Freedom Alliance shipped more than seven tons of these care packages to our brave defenders of freedom serving overseas. Hearts Across The Miles' goal is to make sure no service member goes to mail call only to feel forgotten. Please help us support our troops,so they never feel lonely and disheartened. We owe our freedom to them. They are our nation's heroes! Care packages for men or for women. HeroBox is a non-profit organization that supports deployed, injured, aging and homeless veterans. Our mission is to ensure that every American hero receives the physical and moral support they deserve. Heroes in Action ships care packages monthly to military serving overseas. Each iCare Kit contains a variety of travel size personal hygiene and snack items, and sealed with an abundance of TLC from the heart. Has tips for sending care packages as well as a Soldier adoption program. Our program is dedicated to offering comforts from home and brightening a Soldier’s day with a care package, card or letter of encouragement. Our “adopted” troops, who are deployed thousands of miles away from home, need to be reassured that America cares about them. We appreciate the great sacrifices they are making, and we will do all we can to boost their morale and lift their spirits during this difficult time. We have been supporting the troops since 2003. The mission of Just Our Soldiers’ Helpers Inc., also known as J.O.S.H., is to increase the morale of deployed US service members from all branches of the military. 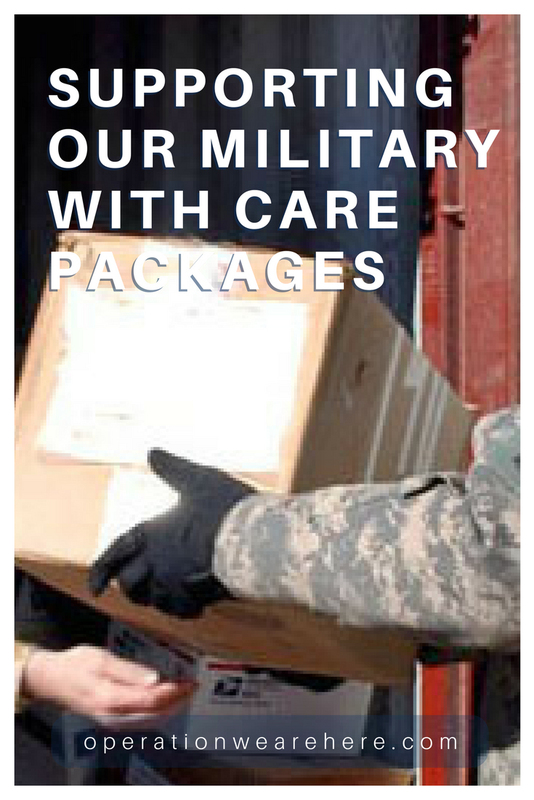 We support our troops by preparing and shipping care packages consisting of healthy snacks/food or hygiene products. Keystone Military Families has been assisting deployed troops, veterans and military families for many years. Our goal is to provide support to the military community while preserving their dignity. We treat each of them with the respect they have earned while serving our country. Kids In Support of Soldiers Inc. (K.I.S.S), was founded with the desire of children to support our men and women in the armed forces by providing them with the simple things in life. Things we take for granted, or don't even think of, are priceless commodities to those serving. K.I.S.S. is a program run by children, with the help of some adults, that want to make a difference in a soldiers life no matter what state they are from, or what branch of service they are in. All decisions are made by the children allowing them to comprehend the difference they are making and that this is THEIR program. Each package that is sent is sent to a particular soldier and is packaged by the children with love and appreciation for what the soldiers are doing for our freedoms. Military Connections is a non-profit organization that provides care packages, equipment and various supplies to the soldiers. Our mission is to reach out and touch the lives of as many U.S. soldiers with support and encouragement as we can. We do this by sending them boxes of goodies and letters "monthly" wherever they are around the world. We especially want to encourage those not receiving any or little support from home. We desire to lift them up giving them hope and the knowledge that someone cares. Molly's Adopt a Sailor Project, a broad based, collaborative and community initiative to support deployed United States Military Personnel by way of cards, letters, and care packages filled with love, support, and necessities from home. Lots of people seem to agree that it's easier to let us remember that they want to send a package out every month, or every other month, or every holiday than it is to go shopping themselves. Just give us criteria for selecting soldiers and your budget and we'll do the rest. Then you'll be sure no matter how busy you get, you're keeping those smiles coming. We've heard from countless members of the Armed Forces serving in the Middle East about items that the military does not provide, are hard to come by and they really appreciate getting . That's why Move America Forward has responded and compiled care packages that contain these goods as a way of saying "thank you" for their sacrifices and courage. Care packages are packed full of gourmet coffee, Oreo cookies, Jelly Belly jelly beans, high-quality beef jerky, trial mix, Gatorade, deodorant, Chap Stick, sun block, CDs and much more. We are a nonprofit organization formed with the mission to support troops and their family members by providing care and comfort items and expressions of appreciation for their service and sacrifices. Historically, Americans have shown their support to our Troops serving in times of war in many ways. By writing letters, mailing care packages, or by showing support for a deployed service member's family, Americans have opened up their hearts, homes, and wallets to show that they support those who serve. Operation: Care and Comfort is proud to continue this tradition of service. We are an all volunteer not for profit organization, dedicated to our goal of making sure that no deployed hero goes without mail. Operation Care Packages - When deployed, almost nothing puts a smile on a soldier’s face more than receiving a package from home. Your donations help send requested items to deployed troops – from the necessities to Once In A Lifetime items Like TV’s, Xbox's, games and movies. If they request it, we try and fulfill it! We are a dedicated group of volunteers with a mission to send support to our American service men and women serving our country. We are a veteran family-founded organization seeking to connect the community with deployed service members each year during the holiday season. What began as a great idea in 2010 supporting just one person in Afghanistan, has flourished into an over-5,000 member network supporting deployed service members world-wide. Operation Gratitude annually sends 200,000+ care packages filled with food, entertainment, hygiene, and handmade items, plus personal letters of appreciation to veterans, First Responders, New Recruits, Wounded Heroes, their Care Givers, and to individually named U.S. service members deployed overseas and their families waiting at home. Our mission is to lift the spirits and meet the evolving needs of the Military and First Responder communities, and provide volunteer opportunities for civilians anywhere in America to express their appreciation to all who serve our nation. What sets OI apart from other organizations is our philosophy that “less is more.” Our goal is to provide each of the nearly 325,000 deployed troops around the world with something from home every month during their entire deployment – and to do so without bogging down the military mail system or taking away from the mission. The OI Civilian-to-Military Delivery System ® reaches more by sending less. The cornerstone of our system is the Civilian Ration ® (called C-rat ®). Designed for delivery to the frontlines, C-rats are individual quart-sized baggies that contain a personal note from a caring civilian at home and a few treats such as snacks, games and personal care products. The most important part of the C-rat is the letter from a person who has never met that Soldier, Sailor, Marine or Airman, but takes the time to write his or her expressions of care and concern. Join us in appreciating our nation's heroes! Our goal is to ship as many care packages as possible to deployed service members. Sends care packages to the Troops. Looking for donations of AT&T phone cards and used printer ink cartridges. Currently looking for Teachers and Troops for for classrooms to correspond with troops. My hope and number one request is that you would adopt-a-troop. It means that you commit to writing a letter each week (not an email) so that your adopted troop get a physical letter at mail call, and sending a package once a month. I started OSA with the hope of getting our deployed personnel adopted out to the public, so that they would be encouraged while in Iraq, Afghanistan or any of the 100 plus countries we have troops stationed. We often get letters requesting adoption and support because the government hired contractors are charging way to much at the base stores. Some just wish to have someone to write to and visit with. Most need some sort of help with the items listed below. Items needed include: personal hygiene items, books, magazines, CD's, DVD's, boots, and new uniforms items. I know some may feel that boots and new uniform items are over the top, there NOT. Remember a gift is not a gift if it costs you nothing, and this is truly about helping those who defend our country and need support. The mission of Operation Support Our Troops is to support the morale and well-being of American forces by providing comfort, resources and education to them and their families both while they are deployed in harm’s way and after their return. As a volunteer based non-profit organization, we provide the opportunity for our community members to express their appreciation and also offer support for our troops. Engaged in the longest war of our country’s history and with our servicemen and women completing multiple tours of duty, we are committed to showing them that "We Have NOT Forgotten." Operation Troop Appreciation presents a united front to our deployed military by providing a unit-level support with "wish-list" requests that contribute to troop morale. We are a group of family and friends of local military personel and feel that we need to help make their deployment a little more comfortable in this 130 degree temperature plus environment! We send them items that they have requested. Operation: With Love from Home works to support our deployed armed forces stationed in harm's way. Supported by the Community Outreach Department at Queen of the Valley Medical Center, OWLFH counts on a group of non-partisan volunteers who recognize the need to keep our service men and women are in our hearts and prayers. The group actively supports their efforts and recognizes their sacrifices on behalf of our country. Each package also contains a hand-written letter of support and thanks. Sometimes, these packages are the only correspondence troops receive from home. They serve as a vital link to remind troops they are valued and loved. Son, Brother, Friend, and most of all our Hero!!! In April of 2006, when two care packages that my husband Herb and I had mailed to our son Eric in Iraq were returned to us as undeliverable, it was a harsh reminder that our son was gone. Only days earlier we had received that dreaded knock on our door by 2 U.S. Marines, coming to tell us that our son was killed in Iraq. Now, as we stood there just staring at the packages, we knew we had to do SOMETHING. My husband, Herb, suggested that even though Eric could no longer use the items we had so lovingly packed for him in those Care Packages, his fellow Marines would most certainly have need for them. So we repackaged the items and sent them on to the Chaplain of Eric’s Unit in Iraq. Thus began the L.Cpl. Eric A. Palmisano Care Package Project. We have shipped over 1600 Care Packages to troops in Iraq and Afghanistan since May 2006. Monetary donations are always welcome and appreciated to offset shipping costs! We are a group committed to supporting not only ALL branches of military and families (active, reserves, veterans, injured/wounded, the fallen families) but each other as women who have a desire & spirit of giving & sharing. Serve!, Inc has established an ongoing program of mailing “packages from home” to servicemen and women overseas. Serve!, Inc, using drop boxes and donation collection boxes throughout southeastern Connecticut and Southwestern Rhode Island continues to collect items to ship overseas to service people several times a month. St. Michael's Soldier's is a faith-based, not for profit ministry that provides "a little bit of home" to the deployed men and women of the US military. We do this through "Home Sweet Home" boxes, filled with items that are used everyday, but may not be readily available to those who have volunteered to protect our freedom; items like tooth brushes and tooth paste, soap, shampoo, shaving cream, deodorant, t-shirt, socks, blankets, food items, and prayer. Support Our Soldiers (SOS) is a military support non-profit organization based in Fort Worth, Texas. This community driven group focuses on sending care packages of food, activities, and toiletries to soldiers overseas. Treasure Our Troops was started when the founders nephews were deployed to Afghanistan in January of 2009. Finding out that a lot of our soldiers have no one to write to them, send them care packages Treasure our Troops was formed! Our mission is to send as many care packages and written letters as possible to our deployed soldiers overseas as well as our wounded soldiers in the local hospitals. Hosts an annual care package drive to be sent to deployed, single service members. USO Holiday Care Packages include decorations, snacks, DVDs and games to help those serving in remote corners of the world celebrate American holidays. In 2015, the USO has continued to offer seasonal holiday care packages to help keep service members connected to home, no matter how far away they may be. Expeditionary troops can also look forward to fall holiday boxes which will feature a Halloween/Thanksgiving theme to help them celebrate the holidays. The Ladies of Liberty team of Soldiers' Angels focuses on the needs of deployed female servicemembers. We understand that females are instrumental in the current war (as in the past), and make special efforts to support them in their missions while showcasing our appreciation for their service. We assist with supplies for their unique health and hygiene needs, and help them experience a few pampering moments to rejuvenate and "be good to themselves." Operation Courage is Beautiful is a community project making a difference in the lives of women in the military. We send free care packages to those servicewomen serving overseas in places like Iraq and Afghanistan. Operation SHE-RO - Female warriors are fighting for our freedoms every day and this program was designed specifically to care for their unique/personal needs while deployed. In addition to custom contents of their care boxes, we include room deodorizers, nail paint, spa items, body sprays, lotions, and other items to provide a relaxing moment while far from home. Many of the base markets/PX run out or do not carry items these ladies need so with your help we are able to offset the deficits. The contributions of our female military members have paved the way for young women to become anything they dream to be and they are role models for women everywhere. We are honored to send TLC to these SHE-Roes as they fight to defend our way of life. Help us welcome home single service members returning from deployment to barracks as home. Soldiers returning from a deployment often return to an empty barracks room, a room without some basic essentials such as pillows, sheets, blankets, towels and toiletries and more. Our Operation Welcome Home Project helps provide these items, so these soldier can come home to a true hero’s welcome. Operation Once in a Lifetime has donated hundreds of thousands of dollars in linens and toiletries to military units all over the world in the past 5 years. Our service men and women are doing more than their part. They need and deserve all the care packages, love and support that we can give. But at Christmas and Mother's Day, they want to send their love back – back to their wives, fiancés, girlfriends and moms. This program is designed to let our heroes be heroes yet again, by allowing them to send their holiday gifts and a love note to their quiet hero at home. This is accomplished through the generosity and appreciation of businesses and individuals who sponsor a servicemen's gifts home. The LPE Family Package was designed for our military families. It is our goal to deliver this package to each family dealing with deployment. It is our way of saying how much we love and appreciate them for their service and sacrifice. Items in our package can offer emotional and psychological support for family members. Research shows that items similar to those in our package help meet these needs for people in similar stress-related situations. Shoeboxes for Military Spouses, the nation's only program of its kind, offers you a way of saying thanks by providing you the opportunity to prepare a shoebox gift for a military spouse. Our youngest heroes at home need to be honored too. These children of serving military are remembered through our Littlest Heroes Care Packages. Each care package we deliver may include items like a bed time story, a puzzle, and handwritten note thanking the Littlest Hero for their service too. A Book About Jesus is always included. Wounded Soldiers - We receive requests from our military hospitals, both here and abroad, as well as the field hospitals in Iraq and Afghanistan, who are treating those who are often able to return to the battlefield. At home, the needs are more centered on rehabilitation. Abroad, even clothing items and scrubs are in short supply. Because the needs vary greatly and some requests have to be special ordered, like handi-pockets for wheelchairs and walkers, gait belts used to transport patients from bed to wheelchair, and knorks, a combination knife and fork used by our heroes who have lost use of one of their arms, we are asking only for monetary donations to purchase specifically requested items. Hearts Across The Miles' goal is to make sure no service member goes to mail call only to feel forgotten. Please help us support our troops,so they never feel lonely and disheartened. We owe our freedom to them. They are our nation's heroes! Operation Gratitude provides special Wounded Warrior Care Packages to service members recovering in Military Hospitals and Wounded Warrior Transition units located on military bases throughout the United States. Operation Quiet Comfort exists solely for the purpose of honoring and comforting America’s military men and women who become sick and injured while serving in harm’s way. We also provide support to those who care for them. We collect, package and ship supplies for U.S. Military men and women receiving care at medical facilities abroad. Often our injured men and women arrive for medical care without their belongings, and it can take weeks before those belongings catch up with them – and sometimes they don’t arrive at all. Even when injured our troops need items like hygiene and grooming products, clothing, entertainment and support from the home front. Our goals are to ensure that every deployed service member and veteran in a Veteran’s home or hospital receives a care package or care letter. Annual year-round support and the Challenge America Campaign (July and November--national packing events) help to support these goals. Another main goal is to receive, via donations, 500 warm winter coats for our Homeless Veterans (cleaning tags attached). VA Hospitals - We visit the area VA hospitals in Palo Alto, Livermore and Martinez and provide necessities on their "wish lists". We deliver homemade patriotic pillow cases, coffee and food, lap blankets, magazines and many other items requested by the hospitals to make their residents more comfortable. If you are interested in providing pillow cases and/or lap blankets please contact our Veterans Committee chair mom. There are many other ways that come up throughout the year that we help veterans and veteran organizations. We hope we can count on your continued support to carry on this important mission in our community. Our Heroes’ Journey started the Cheers for Heroes program to bring smiles to combat wounded veterans and vets who are living in nursing facilities or hospitals around the country. Together with our wonderful volunteers, we send cards and care packages to make sure all our veterans are remembered during the holidays. Operation Healing Angel is where you can thank all our brave veterans and families in so many ways even adopting a hospital to send care to as a group or individual throughout the year . We try to match you up to your closest VA in need too . In our on-going misson to express the appreciation of the American people for the sacrifices of our military, Operation Gratitude has launched a new program to deliver thousands of care packages to Military Veterans all across the country. A “Welcome Home Heroes” celebration sponsored by the Veterans of Foreign Wars (VFW), a weekly gathering of mostly World War II veterans and a Vietnam Veterans picnic are just a few of the venues at which many of the new “Veterans Care Packages” were recently distributed…and emotionally received. Operation Cheers for Heroes requires us to coordinate directly with staff members at VA hospitals in each state. Since the Health Insurance Portability and Accountability Act of 1986 (HIPAA) protects our veterans’ sensitive personal information, we don’t ever know our heroes’ names or why they’re hospitalized—but we do know that every service member, current or former, deserves to be remembered all year long. Our dedicated volunteers send the cards and care packages we gather to our points of contact at each hospital. From there, they’re distributed to those who could use a little pick-me-up. Packages From Home works directly with the Arizona Department of Veterans Affairs (VA), Buckeye Outreach for Social Services (B.O.S.S. ), and other military support non-profits throughout the country to provide food and hygiene items to veterans who are in need. Packages From Home also provides thousands of hygiene kits to the annual Maricopa County StandDown, the Glendale Stand Up for Veterans, and other veteran-support events that provide needed products and services to thousands of homeless and at-risk veterans every year. Our Task Force Smile program seeks to bring a smile to our critically ill and sick military children through revitalizing treatment/play areas, entertainment, and ensuring every critically ill – sick military child receives a toy or game while undergoing treatment in military hospital (year-round). Here in the U.S, the U.S. Postal Service is the only means available to ship to APO/FPO addresses. Oconus.com has a database of more than 700 companies that ship to APOs. Please contact us with special requests for bulk orders, support for special projects or anything else to make life a little easier for the brave men and women of the US Armed Forces. Care Packs For Heroes' mission is to provide an efficient, simple service for friends and relatives of soldiers to send "Care Packages" during the time of active deployment. Have you ever tasted a product, and knew immediately that it could have been made better? That exact attitude is the basis for us starting Damn Good Foods. Regardless of cost and the effort necessary, we will provide only the best possible products, or we simply just won't make it. Fat Joe’s Jerky is produced in the Great State of Texas! We offer mesquite smoked beef jerky in both mild and our original (spicy) recipes. Our products are MSG free, but better than that; they are recommended by Fat Joe! We proudly serve our military and local communities. Show our deployed soldiers how much you appreciate them. Send a Military Care Package with your Free Personalized Message for your loved ones that are deployed overseas or here in the U.S.! All of these care packages are available for delivery to Military APO/FPO addresses - USPS Priority Mail. Your care package will be delivered to most locations within one to two weeks. *U.S. Postal shipping fees apply for APO & FPO addresses. Has military care packages with travel size items: food, snacks, beverages, mini-meals, condiments, medical, personal care, laundry, etc. Shipments to military post offices (i.e. APO or FPO) can only be shipped via the U.S. Postal Service. Military care packages are an indescribable treasure that everyone deployed looks forward to. Troopster is an easy-to-use, personalized care package site that not only has options for items that service members need, but also want. Choose from our prepackaged essential care options as well as the option to create and personalize a pack of your own. Troopster is here for all of the junior enlisted service members spending their first time away from home as well as for the seasoned military personnel. Links for additional support organizations (airport greeters & welcome home signs, Bibles, devotionals & Bible studies, cards & letters, chaplain resources, coloring pages, humanitarian aid, military working dog & handlers, other deployment support organizations, pet adoption & foster care, prayer support and many other resource) are all listed above. Benita Koeman of Operation We Are Here is a participant in the Amazon Services LLC Associates Program, an affiliate advertising program designed to provide a means for sites to earn advertising fees by advertising and linking to Amazon.com. When you purchase a product that is linked to Amazon, I earn a small commission which in turn helps me to continue with my mission of providing resources to the military community and military supporters.